THE used auto PARTS recycling AUTHORITY We were green before it was trendy! 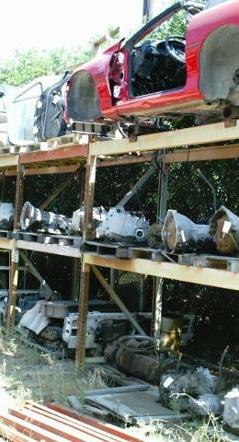 A completely inventoried auto dismantler providing high quality used parts! And, ask about our 6 month and 1 year warranty available for every part we sell! Can't find what you need? Call 866-477-3969! We can find it! We are your used parts source!... We have it or we will get it! We are experienced in solving your used parts problems. Our Pinnacle Pro Inventory management system allows us instant access to every part in our vast inventory, eliminating the the old 'junkyard' myth: 'The owner knows everything that he has.' With nearly 100,000 individually inventoried items in stock, (with locations, colors, condition, etc...) , the 'normal' human memory just can't handle that!... And, through our trading partners, access to over 115 million individual parts, within seconds! Our courteous staff can assist you with locating and purchasing the correct part you need along with extended warranties, shipping & delivery, and arranging payment. A credit card authorization form can be printed from this site, to be faxed directly to us (to help prevent credit card fraud, we do not accept card info from voice phone calls). As a footnote, all photos used on this website are actual pictures from our facility or the Waco area. Photos of vehicles seen here are currently in stock and available for parts sales. No 'generic' or 'file' photos were used in the production of this website. Let us know that you're looking at our website and receive $10 or 10% off your first order!